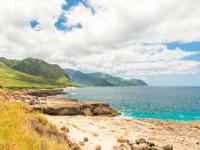 Makaha is located on Oahu's sunny western shore with the backdrop of the scenic Waianae mountain range. This picturesque region has everything you need for a relaxing and luxurious Hawaii vacation. Go swimming or snorkeling at Makaha Beach in the morning and then head out to Kaena Point State Park to enjoy an afternoon coastal hike along with tidepool exploring. A 5-mile round trip hike at Kaena Point provides stunning coastal vistas including stone arches and a large sea cave. Keep an eye out for the dolphins that are often seen in these waters. Golfers will enjoy ocean views from the Makaha Resort Golf Club, and can also drive east to the Ko Olina Golf Course. Drive over to Waikiki to take a surfing lesson or go on an outrigger canoe ride and explore the shops along the waterfront. At Pearl Harbor you can tour the USS Arizona Memorial and downtown Honolulu has numerous historical attractions including Iolani Palace. Makaha Beach is great for swimming, snorkeling and scuba diving during the calmer summer months. Swimming is best in the center area of the beach where there is a sandy bottom and no coral reef. Winter can bring large waves and strong currents, and it's recommended that you stay out of the water during times of high surf. Makaha Beach is known for its excellent surfing waves and is the site of several annual surfing contests. Tables, showers and restrooms make this a nice beach for a picnic, and offshore is a popular scuba diving site called Makaha Caverns with caverns and arches to explore. West of Makaha is Kaena Point State Park where there is a sandy beach at Keawaula Bay that provides fun swimming and bodysurfing during the calmer summer months. Also known as Yokohama Beach, Keawaula sits between two rocky points and is the last sandy beach before Kaena Point shoreline which is bordered by sand dunes. Makaha has a few dining choices including fast food restaurants. Some excellent dining options can be found in the nearby Ko Olina Resort area as well as in the town of Kapolei. Head over to Waikiki for sunset dining along the water. The Aloha Tower Marketplace is a great place to eat and see live music overlooking Honolulu Harbor. Makaha is primarily a residential community with a few convenience stores and small retail stores as well as a grocery store, and also some shops in the nearby town of Waianae. You can find some great shopping not far away in the resort area of Ko Olina as well as a major commercial district in the town of Kapolei. For more fun shopping visit downtown Honolulu and take a walk down Kalakaua and Kuhio Avenues in Waikiki. Renting a car is recommended when staying in a Makaha vacation rental so you have easy access to west shore beaches and attractions as well as day trips to the scenic windward side, the pristine beaches of the north shore, and the excitement, shops and dining opportunities in Waikiki and downtown Honolulu. Makaha is located 34 miles northwest of Honolulu. Most major populated areas of Oahu can also be reached on the public transit system known as "TheBus." Makaha is located on Oahu's leeward (western) coast which is the driest side of the island with abundant sunshine. Oahu's north and eastern shores are generally a bit wetter and cooler than the south and west shores, and the winter months typically see more rain than summer. Temperatures at Makaha range from about 70 to 90 degrees F. throughout the year. Sunny skies, mild temperatures and warm trade winds make Makaha an excellent vacation destination. Rain showers are typically brief and light with ample sunshine even on the rainier days. Ocean conditions vary each day though typically the western and northern shore will have the calmest waters during the summer months while the south shore will have the calmest waters during the winter. Some beaches provide more protection from the open ocean, and if the waves are too big at the beach you visit then you may be able to find a more sheltered beach where water activities are safe. For swimming and ocean activities visit Oahu's lifeguarded beaches. Obey all posted warnings and ask about the conditions on that day for the activities you choose. Makaha vacation homes provide the optimal way to enjoy your Hawaii vacation with all the luxuries of resort living and all the comforts of home. Browse through our Makaha vacation rental listings to get an understanding of the different amenities and property features we offer. Our goal is to provide you with a with an unforgettable Makaha accommodation for your dream Hawaii vacation. We take pride in having the largest selection of high-quality vacation rentals on Oahu and we stand behind our product, making sure only the best of the best Makaha properties are listed on our site. If you have questions about our Makaha rentals or which Oahu destination is best for your vacation needs, please give us a call and we will be happy to assist you. Learn about Oahu's history on the self-guided walking tour of downtown Honolulu sponsored by the Historic Hawaii Foundation and visiting numerous historical buildings including the Mission Houses, St. Andrews Cathedral and Iolani Palace. A walking tour of the Waikiki Historical Trail begins at the Royal Hawaiian Center and is marked by bronze surfboards with informational plaques.